Greece has announced plans to build a 12km (eight-mile) fence along part of its border with Turkey to prevent illegal immigrants from crossing. Public Order Minister Christos Papoutsis said more than 100,000 people had entered Greece illegally last year and Athens had a duty to act. Greece has long complained to Turkey about border security. But the European Commission said such fences were "short-term measures" which did not tackle the root of the problem. The area has become the main route into Greece for migrants from Africa and Asia with an average of 245 people crossing illegally every day in October 2010, according to Frontex, the EU's border agency. The European Commissioner for Home Affairs, Cecilia Malmstroem, has said the numbers are "dramatic". In a statement, Mr Papoutsis said Greece could "no longer tolerate this". "Greek society has exceeded its limit in its capacity to accommodate illegal immigrants," he said. "This is the hard reality and we have an obligation to the Greek citizen to deal with it." But the proposals have come under criticism in Greece, with the Greek Communist Party describing them as "inhuman and ineffective". Bill Frelick from Human Rights Watch told the BBC World Service the fence might "divert some of the flow to other locations, but Greece has quite a long border, quite a lot of coastline, so it's an attempt at a quick fix for a problem that really is much more extensive". "If a person who passes through Greece applies for asylum in Sweden or Germany, their fingerprints show up on what's called the eurodoc system, and they're kicked back to Greece," Mr Frelick said. "And Greece has proven itself completely incapable of handling this problem, and they've gotten precious little support from the EU member-states." Earlier on Monday, a spokesman for the EU Commission said that walls and bars were "short-term measures which will not allow us to tackle illegal immigration in a structural manner". "We made clear with Greece that the country needs sound and long-term structural reforms and measures to better manage its border, to better address the challenges linked to migration flows," Michele Cercone said. "It is important that these borders... are managed in order to discourage and interrupt traffickers and smugglers that exploit [illegal immigrants]." Turkey's Foreign Ministry said it was seeking further information about the plans, but the governor of Edirne, one of the country's border provinces, said all physical barriers were surmountable. "There's a 200km river that can be passed with boats in winter and by foot in summer when the water level is low," Gokhan Sozer told NTV. 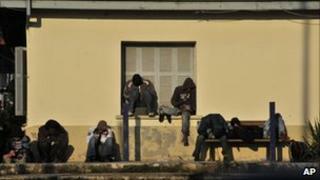 Around 90% of all migrants who illegally enter the EU have come through Greece, say officials. The UN's refugee agency says 38,992 arrived in the 10 months to November 2010, compared with 7,574 for the same period of 2009. In November, Frontex deployed 175 border control specialists to the Orestiada area to help Greece tackle the problem. The agency says this led to a 44% fall in the numbers of people successfully crossing the border.